The CymSkin covers are a great product for those keen on keeping their cymbals in tip-top condition and sounding good - you'll find them worth the comparatively small outlay. Prevents marking, corrosion and other scuffs. Noise reducing. 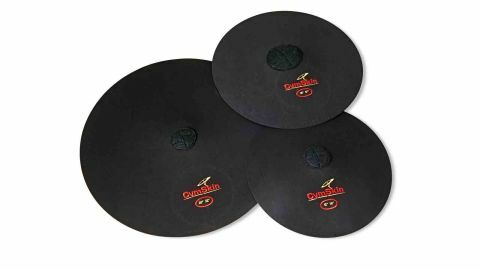 Make cymbals easier to handle. Another way to spend money on your kit! Drummer and CymSkin proprietor Mark McDermott came up with the cymbal cover concept back in 1993. He was trying to find ways of stopping his new cymbals rubbing together while in their case. Mark's seamstress mum came to the rescue by making him a set of covers - these were the Cymskin prototypes, which Mark says are still in use today. "No sticky fingers, no metal-to-metal contact and the surprising bonus of noise reduction are all benefits"
With the aid of an elastic edging, the black coloured cotton wraps around the cymbal. At the centre is a reinforcement felt and to the top there is a colourful embroidered CymSkin logo along with designated cymbal size. The slightly elasticised properties of the cotton allow a snug fit to within one or two inches of tolerance, so each cover will fit one of two sizes - 8"-10", 18"-20", 20"-22", etc. Over time, wear in the case can cause the metal to scuff and logos to become a blur. Sweat can cause corrosion, and finger marks etc can dull the sound and spoil the overall appearance. Mark says there are several benefits to his design; no sticky fingers, no metal-to-metal contact and the surprising bonus of noise reduction during rehearsal. Each cover is placed directly onto the cymbals while still on their stands - simply a matter of removing the winged nut and sliding each CymSkin on. Before they head into their case we sneak a quick play on them where we find it surprising how they manage to tame the sound level, making practice a little more acceptable to the neighbours and your ears. As the elastic draws the cotton material underneath, it holds itself firmly in position. The top of the cymbal is fully covered and, as there is also plenty of material underneath, this allows a full and firm hand grip. We can handle each cymbal confidently, drastically reducing the chance of accidentally dropping one. Being able to man-handle the cymbals in this way also reduces set-up and pack-away time too!